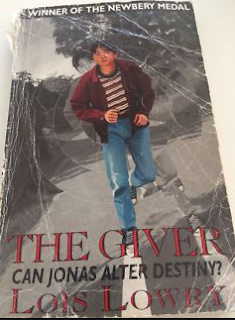 Lois Lowry's The Giver has been a perenniel favourite on school reading lists just about forever, and yet I had never read it. My friend Suzanne pressed a secondhand copy on me last time I saw her, and now finally I can see what all the fuss was about. I think I had vaguely imagined something like The Maze Runner (perhaps I had seen the cover above??) but The Giver is really more of a fable about memory and conformity than a dystopian story, though it does have elements of dystopia about it. Jonas's world at first seems like a rather benign dystopia, as dystopias go. Everyone is part of a well-planned, ordered society, where even the weather is regulated, food is delivered to the door, children are assigned their perfect jobs and trained accordingly. However, this paradise comes at a cost. True emotions have been flattened out almost to non-existence. Music and art and books have been lost. 'Stirrings', the beginnings of love, are eradicated with pills. Even the perception of colour has disappeared. And people who are disobedient or no longer serve a social function are 'released' -- a less benevolent action than it sounds. A deceptively easy read, The Giver is a terrific choice for early high school students. It skims over big issues about difference and conformity, the worth of those things that can't be economically valued (like art, love, or disabled children), and the place of shared stories in building a community. Inspired by Lowry's own father's memory loss, this book is deservedly a modern classic.